We’re happy to partner with publisher HarperCollins to offer a giveaway of their new book Better Call Saul: The World According to Saul Goodman by David Stubbs. Three lucky readers will win this hardcover, 128-page book. 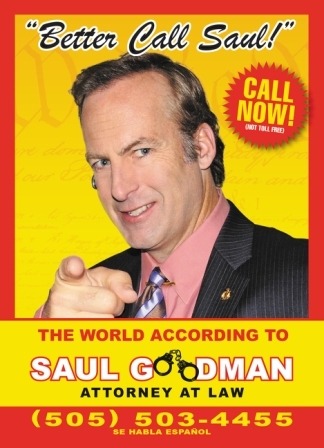 Better Call Saul: The World According to Saul Goodman is currently available to own, visit HarperCollins to order. AMC’s hit series Better Call Saul – the spin-off from the network’s Breaking Bad – recently ended its first season. We’re sad too – we have to wait till next season for more of Bob Odenkirk as the inimitable “bus bench lawyer” Saul Goodman. Cheer up with this HarperCollins guide to all things Saul, loaded with full-color photos and all sorts of info about the character. Three will win the book titled Better Call Saul: The World According to Saul Goodman. Enter using the Rafflecopter form below (U.S. entrants only, no P.O. boxes) by April 29, 2015. Involved in a traffic accident? Three lucky winners will be drawn at random and notified via email. The winners will each have 48 hours to respond to our notification with their complete name and U.S. mailing address (no PO Boxes). Failure to respond within 48 hours will result in forfeiture and another winner will be selected. For complete giveaway rules: Giveaway Rules and Restrictions. Saul is definitely my favorite now. Love the new show!